Description: Great Northern bought four 56-seat coaches from the Frisco in 1966; their fluted sides made them obvious in the normally smooth-sided GN fleet. GN 1073 is the former SLSF 1256, built by Pullman-Standard in 1948 and modified by GN into a 40-seat coach-buffet in 1967. The "Big-G" typically used them on the Winnipeg Limited, Gopher and Badger. It's shown here at Grand Forks ND on the remnant of the Winnipeg train. Scanned from a 126 Instamatic slide. Description: GN coach 1074 is one of the four 56-seat cars the road bought from SLSF in 1966. It's shown at Grand Forks ND for use on the daily Winnipeg train. Scanned from a 126 Instamatic slide. Description: Great Northern Dorm-Lunch Counter car 1140, the Waterton Lake, on the Western Star. Pullman-Standard 1948, for the Empire Builder. Scanned from a 126/Instamatic slide. Description: SP 48-seat coach 2357, built for the Coast Daylight in 1954 by Pullman-Standard. Shown here on Amtrak's Sunset Limited; it was not picked up by the carrier. The windows on these cars were huge, particularly when compared to today's Amcoaches. 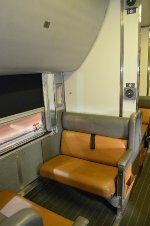 Description: Santa Fe 68-seat Hi-Level coach 535 on Amtrak's Sunset Ltd. Budd, 1956. Built for the El Capitan, it became Amtrak 9909. 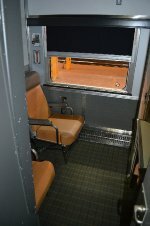 Description: Amtrak 58-seat Hi-Level coach; the former ATSF 718, Budd 1956. Description: Amtrak 44-seat coach 4492, ex ATSF 2882, Pullman-Standard 1947. Description: ATSF 44-seat coach 2878. Pullman-Standard 1947; not picked up by Amtrak. Description: UP diner 4816, on Amtrak Sunset Ltd. ACF 1949. This car was not retained by Amtrak. Description: Amtrak Hi-Level coach 9909; ex ATSF 535, Budd 1956. Built for the El Capitan. Description: SP sleeper 9000 on Amtrak Super Chief; 10/6 plan 9522, Budd 1950, built for the Sunset Limited. Became Amtrak 2680. Description: Amtrak Lounge Car 3360, ex C&O 1903, Pullman-Standard 1950; built as a lunch-counter tavern lounge for service on Pere Marquette routes. Description: Amtrak Sleeper 2013, "Oriole", Budd 1954, ex SCL 6703, B&O 7105. 16 duplex roomettes/4 double bedroom, plan 9536. Description: Amtrak diner 8039, on the Sunset Limited. ex ATSF 1494, Budd 1942. Description: Amtrak sleeper 2350 "Regal Dome" on the Sunset Ltd, 3/74. ACF 1950 for the Super Chief, 4 double bedroom/2 compartments/2 drawing rooms. Description: A pair of NYC baggage cars (ACF 1947) sit on the whiskers by the WP roundhouse in Oroville CA in Jun 1974. They were, supposedly, there for rebuild by Solona Railcar for use on the 1976 Freedom Train. Description: Amtrak sleeper 2456 Willow Grove on tr.20, the Crescent. It was built as SP 9005 by Budd in 1950 as a 10/6 sleeper and became Amtrak 2685 before being converted to HEP as 2456 in 1981. Description: Amtrak diner 8750 on the Auto Train at Lorton VA. Budd 1949, originally A&WP 501 for the Southern Crescent. Description: Amtrak Baggage-Dorm 1616, in the rain at Manassas on the Cardinal. Ex AMT 1410, formerly Army hospital car. St Louis Car, 1952. Description: Amtrak diner 8752 on the Auto Train. Built as L&N 2790 (Budd 1949), became Amtrak 8025 and finally 8752 when converted to HEP. Description: Amtrak Lounge-Dome 9301, on the Auto-Train. Ex AMTK 9362, BN/GN 1392. Budd 1955, built as a "Great Dome" for the Empire Builder. Description: Amtrak Slumbercoach 2080, Loch Sloy; ex Amtk 2024, BN/NP 325. Budd 1959 for the North Coast Limited. Description: Amtrak Table Car 8602, ex AMTK 4562, UP 44-seat coach 5502. St Louis Car, 1960. On the Auto-Train. Description: Amtrak Diner 8559 on the Silver Star, train no.81. Former AMT 8526 and 8060; originally SP 10210, Budd 1950. Description: Amtrak Buffet Car 8702 on the Auto Train; the former Amtrak 3321, 3643, PC 7143 "Molly Pitcher", built as PRR parlor car 7143 (Budd 1951). Description: Amtrak diner 8514 on the Cardinal; formerly Amtk 8338, PC 4566, NYC 466; Budd 1948. Description: Amtrak 10/6 SLEEPER 2444, the former AMTK 2697, originally SP 9021, Budd 1950 Plan 9522, for the Sunset Limited. Description: Amtrak Diner 8559, ex AMTK 8060, ex SP 10210; Built as 48-seat diner, Budd 1950, for the Sunset Limited. Description: Amtrak 11 Double Bedroom sleeper 2230 southbound through Alexandria VA. Built as a 5 double-bedroom/buffet lounge by P-S in 1956; was rebuilt into an 11DB UP 1701 Star Bay in 1965; to Amtrak 2250; renumbered to 2230 when converted to HEP. Description: Amtrak Bag-Dorm 1630 on the Cardinal; power is F40PH 318, four Amcoaches follow 1630 with diner Silver Tureen and two heritage sleepers (Pacific Beauty, Pacific Waves) bringing up the rear. 1630 the former AMT 1414, built as Army Hospital Car 89522, St Louis Car 1952. Description: Amtrak diner 8514 shows signs of its days on the Water Level Route. It was built as a grill-diner for the NYC by Budd in 1948. Description: Amtrak Viewliner Diner 8400, the only one of its kind. Description: Amtrak sleeper 2994, Pine Lodge. 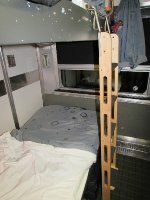 10 roomette/6 double bedroom; ex AMTK 2725, ATSF 1636, Budd 1950. Description: Amtrak baggage car 1191, on train 81, the Silver Star. It's the former AMT 1428, built for US Army as 89542 by St Louis Car in 1953. Description: MRLX 2144 stored at Granite Cty IL. It was built as MILW 4, Lake Pepin for the Olympian Hiawatha as a 10 roomette, 6 double bedroom to Pullman-Standard plan 4137 in Oct 1948. Sold to Canadian National in 1967 where it became CN 2144, Vermillion River. It later passed to Via Rail Canada. Description: SP diner 290, built as 10214 in 1948 for the Sunset Limited. Currently at the California State Railroad Museum. Description: Amtrak lounge 33022, train 5, the California Zephyr. Superliner I, Pullman-Standard 1981. Description: Private car PPCX 800380, built as buffet-lounge DRGW 1291 "Royal Gorge", Pullman-Standard, 1950. Shown on westbound no5, the California Zephyr. Description: Private car PPCX 800392, "Plaza Santa Fe", former ATSF 502, Pullman-Standard 1950 as a dome-lounge for Super Chief service. Description: Detail of dome section, PPCX 800392, originally ATSF 502. Shown on Amtrak train 5, the westbound California Zephyr. Description: Amtrak California coach 6461, Pebble Beach. Alstom 2001. Description: VIA Rail sleeper 88207; Built by Budd in 1955 as CP 8207, same name. Heavily modified for Prestige Class service; details of blanked out windows. Description: VIA Rail 88227, Chateau Varennes on train no1 in Winnipeg. Built by Budd in 1955 as CP 8227 with 4 sections,8 duplex roomettes and 3 double bedrooms and 1 drawing room. 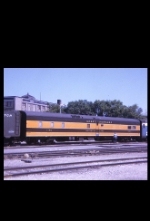 Taken by VIA Rail in 1978, recently modified for Prestige Class service with only six bedrooms onboard. Gray letterboard stripe and blanked out windows are signs of modification. Description: VIA Rail 88213, Chateau Lauzon at Jasper, deadheading to Vancouver. Car was heavily rebuilt for Prestige Class service with 6 large bedrooms replacing the existing 3 section, 8 duplex roomette, 3 double bedroom, 1 drawing room configuration. VIA is rebuilding at least eight of the 29 Chateau-series car in this fashion. Description: The classic Pullman section, made up of upper and lower berths, as on VIA Rail 8324, Dunsmuir Manor, a Manor-series sleeping car built by Budd in 1955. Description: A double bedroom in day configuration; VIA Rail Canada 8324, Dunsmuir Manor, of the Manor-series cars, Budd 1955. Two chairs, a sink and very small bathroom. Description: VIA Rail Canada double bedroom in night configuration; Allan Manor; of the Manor-series sleepers (Budd 1955).